This news post explains the basic menu options under Alt + F2, xlobbys setup menu. This news post will be updated when necessary to reflect any changes in these menus. Also I will be posting more in depth details on how each feature or setting works so users get a better idea of how to setup and use all the xLobby items in these menus. Click on any of the menu images to enlarge. 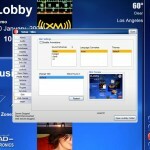 Any questions or comments should be directed to the xLobby forum under support. The About Screen Tab provides information on 1. License Information, 2. Misc Information like memory usage and Hardware rendering details, 3. The current build of xLobby that your using. The xLobby Unique ID license number is generated from the hardware in your xLobby system and is unique. The Activate button is used to activate a valid license from the xLobby servers and will only validate a registered license. Copy ID to clipboard is used to copy the unique ID number for personal reference or for use by Calrad technical staff to register a machine when logged in thru Log-MeIn. The Audio Screen Tab is used to configure xLobbys sound settings for audio playback, this includes multizone audio. In this menu you can create internal audio zones and assign them to a audio output devices. The Auto Play Screen Tab is used to trigger a specific event based off the file extensions found on newly found media, such as a pop up box when a DVD is inserted. The Database Screen Tab is where xLobby manages all of the media content that is shown and displayed in the interface GUI. 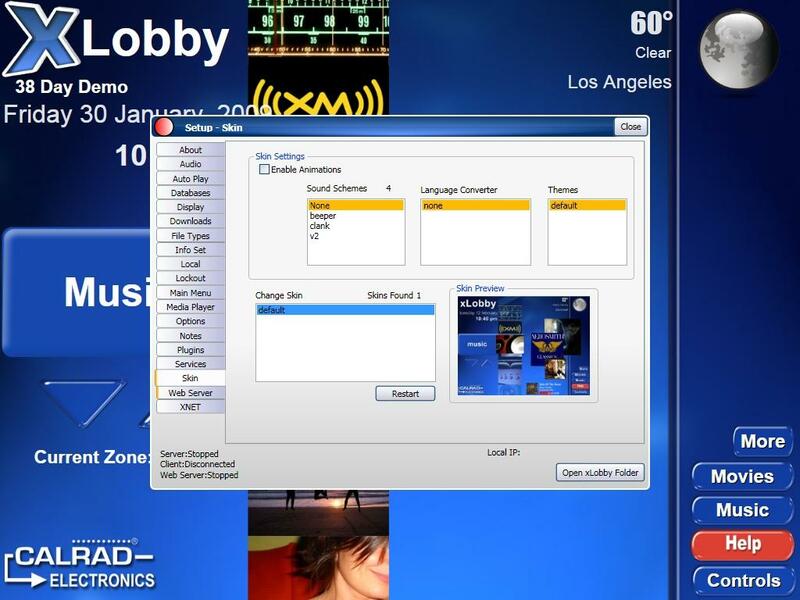 The Display Screen Tab is used to confiure xLobby between primary and secondary displays. The Display Screen Tab will be used to download updates, plugins, skins. This feature for xLobby V3 will be available soon. The File Types Screen Tab menu is used for launching external media players for different file types like winamp, zoom player, etc. The Info Set Screen Tab menu is used for creating static information that can be used within the skin as a variable. Example: %variable>static>telephone%. The Local Screen Tab is used to setup the location information that is used by xLobbys calendar based trigger system for home automation control. Selection of a RS232 port to control xLobby from external devices. 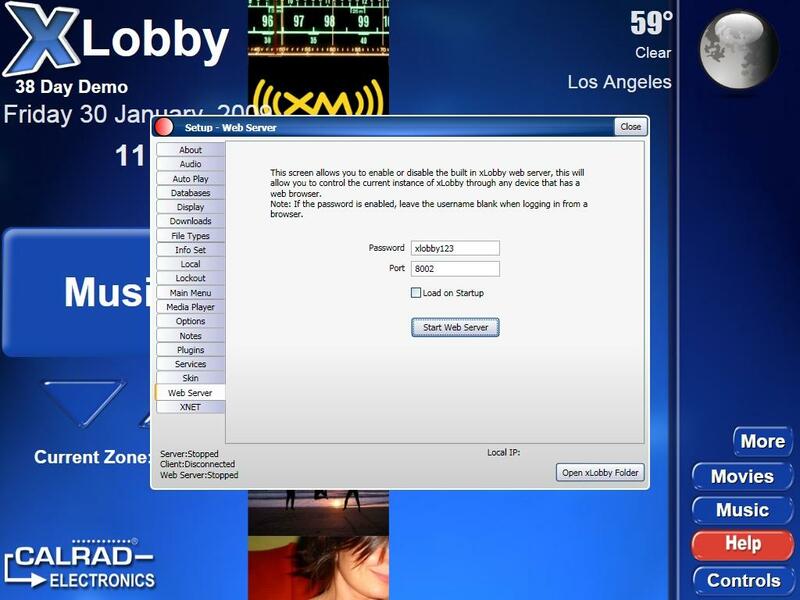 The Lockout Screen Tab Enables users to lockout acsess to the Setup+Skin editor menus. A user created password is required to gain access. The Main Menu Screen Tab provides users the ability to show or hide main menu items in the default skin or any new menu that is created and follows the database rules under the database editor. The Media Player Screen Tab is for setting up all the options for the playback of Movies. The Options Screen Tab provides users access to several settings that can be enabled or disabled. The Notes Screen Tab is a text field where you can store information that is related to the current installation of xLobby. The Plugins Screen Tab shows what plugins are installed and provides access to the settings for them. The Services Screen Tab is used to setup and view any service that is connected to xLobby, for example Russound, UPB, Insteon, Lutron, Aprilaire HVAC, GE, ELK, WACI. The Skin Screen Tab provides users access to preview or use different xLoby skins and sound schemes. The Web Server Tab allows users to enable or disable the built in xLobby web server, this will allow you to control the current instance of xLobby through any device that has a web browser. XNET Screen Tab allows users to setup a communications system that is used by xLobby clients to communicate with other xLobby hardware running in server mode. Clients will get their databases from the server and can control the local audio zones on the server machine. This news post may be updated on a regular bassis to reflect any changes in these menus. This entry was posted on Wednesday, February 4th, 2009 at 1:02 pm	and is filed under Uncategorized. You can follow any responses to this entry through the RSS 2.0 feed. Both comments and pings are currently closed.